What the NBA loves in Joel Embiid can't be taught. But it can be bought. LAWRENCE, Kan. — They still talk — heart to heart, about life, family, basketball — a couple times a week. But not about that. "We’re not really talking about that right now," Minnesota Timberwolves forward Luc Richard Mbah a Moute, friend and confidant of one Joel Hans Embiid, tells FOXSportsKansasCity.com. "We’re just talking about him finishing this season." That being the NBA Draft. That being the fact that DraftExpress.com projects Kansas’ freshman center to be the No. 1 overall pick to Milwaukee this summer. That being the fact that NBADraft.net says the same damn thing: No. 1 overall. Still. "Yeah, yeah, that’s great," Mbah a Moute, the native of Cameroon who "discovered" his fellow countryman a few years back, basically kick-starting Embiid’s path to Kansas and the fast track of American basketball. "It’s a good place to be. "And bear in mind, he’s still got a couple more games and a (conference) tournament and the NCAA tournament to worry about, so we’re not really talking about that right now. We’re just trying to finish this season well and worry about that after this season is over." The closer you get to Embiid’s inner circle, the tighter the cards get pressed against the chest. Say it ain’t so, JoJo. Stay or go? Scouts are enraptured, although the teen’s recurring back problems — pains that stem all the way to his high school days — send up a big red flag as far as durability, especially at the next level, where the travel grind is relentless. Embiid is flattered by the attention but has said even he’s not sure he’s ready. And he might not be. But the NBA is, checkbook in hand. "Embiid is probably going to be a top-five pick," says draftnik Jonathan Givony, the big cheese at DraftExpress.com. "It’s very rare for a player to pass that up, although that does happen." So here we are, Senior Night in Lawrence, the home finale against Texas Tech. It’s Freshman Night, too, as wing man Andrew Wiggins has intimated that this will be his one and only collegiate season. Meanwhile, Embiid, the 7-footer with the 7-foot-5 wingspan, will be sidelined on the bench, nursing lower back pain and resting up for the tournaments to come, a glorious spectator, his internal clock ticking. Oh, a penny for those thoughts. 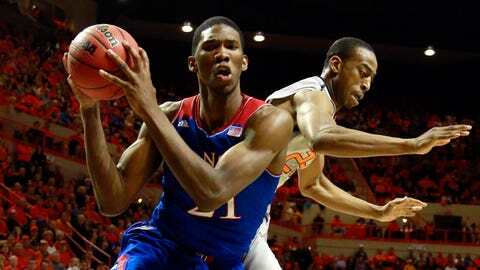 Because up in the stands at Allen Fieldhouse, Jayhawk fans will be thinking of Embiid. 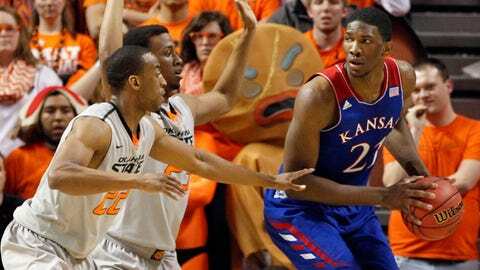 And wondering if they’ve already seen him play in Lawrence, wearing KU blue, for the last time. Justin Harden wants to make this clear: Joel hasn’t asked his opinion on the matter. But if he did, Embiid’s old high school coach says, he’d encourage him to make the jump to the next level. Take the money and run. While you still can. Lookin’ good! CLICK HERE to check out our gallery of cheerleaders from around the Big 12. "Because you only get an opportunity to play in the NBA once. … He could have a catastrophic injury. But at the same time, we can’t live our lives in fear of a catastrophic injury. "I would suggest he goes to the NBA, because he could be a top-three pick, and not too many people can say that." The first time he saw Embiid projected as the top pick in the draft, it blew Harden’s mind. It still sort of does. The young man he took on two years ago was a skinny transfer from Montverde (Fla.) Academy who didn’t pick up a basketball until he was 15, raw as sculpting clay. And almost as soft. "Well, let’s just say Joel didn’t like to go to the weight room," Harden says with a laugh. Before his senior season, Embiid was benching something like 140-150 pounds, max, the coach recalls. Too much lean, not enough mean. "He didn’t work very hard at it (in high school)," Harden recalls. "The one thing I tried to work on him and tried to get through to him (was), ‘Just because you’re tall, you’re going to have to bang against (bodies like) Joakim Noah every night,’ and those are big boys." When the coach saw Embiid play with Kansas at Florida on Dec. 10, it was clear that somebody — several somebodies — on the Jayhawk staff had gotten the message through. The scrawny teen from Africa was cut like a man. "(The Big 12 is) a tough, physical conference, and physicality, that was probably the biggest element that he was lacking," Harden says. "So for him to be able to sustain that and play at a high level … and be as efficient as he has, has been great. He’s taken everybody by surprise by how he’s continued to rise. "I don’t know that you’ll ever find, maybe in the history of basketball, someone who could possibly rise the way he has risen over the last four years. He literally goes from a JV player as a junior to a high school varsity player to a college player to a professional — I don’t know if anyone has ascended through those four ranks in that amount of time. So it’s a unique situation." It’s a quandary, too. Imagine what Embiid would look like after one more year of strength training, one more year to polish the rough edges, one more year of coach Bill Self’s molding and shaping, cajoling and pushing. But after this week, with the big man sidelined for the second time in five weeks because of that aching back, there’s a question of just how much pushing Embiid can take, how much tread is actually on those tires. The average length of an NBA career is roughly five years, give or take. According to the blog WeakSideAwareness, the average career length for an NBA player 7 feet or taller between 1946 and 2011 was 5.78 seasons. Back and forth the arguments go, a Wimbledon of hypotheticals playing out inside your head. The money will be there next year, too; you’ve got the rest of your life to be a cynical pro. But what if there’s another awkward fall in Stillwater? What if there’s a Marcus Smart-style meltdown? You can be a Jayhawk for life, but you can set yourself — and your family — up for life only once. "The thing with his game that really makes you drop your jaw," Givony continues, "is he’s really talented. Guys who are 7 feet tall and can move the way he does are hard to find anywhere." Which is the same song in Cameroon that it is in Lawrence. Embiid has shown he can be coached, can soak things up like a sponge, and quickly. And yet what the NBA really loves in him, and will always love in him, can’t be taught. It can, however, be bought. "And his reaction to everything, as someone who (had) only been playing basketball for like six months — to me, it was crazy," says Mbah a Moute, who’d spotted young Embiid at a camp in Africa almost four years ago and fell in love with the footwork, size, the tools almost immediately. "I’m not surprised we’re talking about a draft pick. I always thought he had the talent. "I guess I’ll say I’m surprised, at this point in his career, we’re talking about him being a top pick in the draft. I knew he was going to be a very good player, but I didn’t know he was going to develop this quick. But that’s honestly a credit to the hard work he’s put in." The ceiling is high; as high as your dreams. But nothing is promised. And nothing, other than salary, is guaranteed.